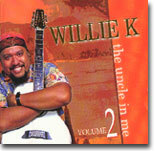 Review: Legendary Willie K, musician extraordinaire , producer and composer is showcasing his talents in Vol. 2 of his "best". It offers you a glimpse of the evolutionary musical process of this world class guitarist and arranger. Experience the depth, heart, soul and the emotion of "Uncle Wilie K". Enjoy!! !